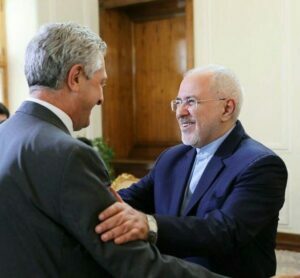 Iranian Foreign Minister Mohammad Javad Zarif and the UN High Commissioner for Refugees (UNHCR) Filippo Grandi have sat for talks on the issue of refugees in the Middle East. During the Sunday meeting in Tehran, the two sides exchanged views on the latest situation of Syrian and Afghan refugees, and other issues of mutual interests. The UN high commissioner arrived in Tehran after his visits to Syria and Lebanon. His regional tour comes as there are discussions on the possible repatriation of some 5.6 million refugees in the region. Meanwhile, the issue of Afghan refugees in Iran has always been a key point of talks between Tehran and the UN as Iran has been hosting hundreds of thousands of these refugees since the late 1970s, when their country was occupied by the Soviet Union troops. Although many of those refugees have returned to their country voluntarily, there are still many documented and undocumented Afghans in Iran.